Airborne species aren’t yet expected to soar through the sky around Catalina Island in big numbers. AVALON ― Tourists and marine enthusiasts once flocked to Catalina Island to witness large numbers of flying fish emerge from the water and pierce the air surrounding a 50-foot power catamaran cruising across the channel just after sunset on any given night. The numbers of flying fish quickly diminished, however, as warming waters surrounding Catalina Island caused once plentiful kelp forests to all but disappear. No kelp forests meant the flying fish would no longer be found near the Catalina coast. Capt. John King, who offered flying fish tours aboard his catamaran, Catallac, took fewer trips before outsourcing the offering altogether. The flying fish were not back last summer like they were before, King said. Accordingly he leased out his catamaran for flying fish tours to the Santa Catalina Island Company. When El Niño brought warmer temperatures to the local waters it caused a lot of the kelp to die. The kelp thrives in cold water but was diminishing around Catalina Island due to the warmer water. The flying fish rely on the kelp to spawn and attach their eggs. The flying fish did return as did the kelp according to Capt. Alison Osinski, owner of Aquatic Consulting Services in Avalon. “The kelp disappeared a year ago because of the warm temperature of the water. It’s back. Kelp grows. It’s a very fast growing plant. It didn’t get wiped out totally, but it’s certainly growing back,” Osinski stated. There is a regrowth of kelp, King agreed, but he is not seeing the lush forest of kelp as there was in the past. 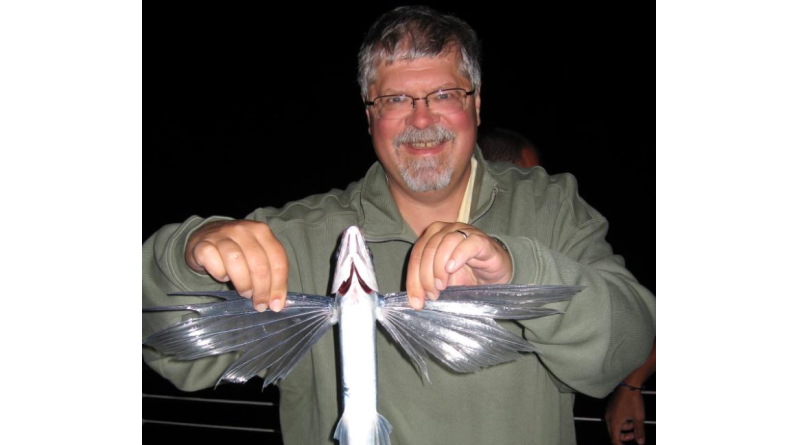 When the flying fish were plentiful and he was providing the night tours, it was not uncommon for the fish to fly right onto the boat. If a passenger got hit by a flying fish, they were given a free t-shirt. “Three years ago, we gave away 24 t-shirts in one season and last year only 11 shirts were given away,” King stated. King does not expect to see more flying fish this summer, as cooler water hasn’t yet returned. It remains to be seen what the upcoming season for flying fish will bring, which begins in May or June. Meanwhile King’s Afishinados Charters will begin offering a new charter service for couples, thanks to a waterside permit approved by the Avalon City Council on Feb. 21. Couples specifically will be able to rent a private charter for two aboard a 14-foot skiff to cruise around Catalina Island. The City Council’s permit approval allows Afishinados to add a third boat to its charter business.